Titanfall 2 - Game Review - Guest Blog from LAN Mob's Regular - "Dictator"
Talk to pretty much anyone who knows me, and they will tell you I am a huge fan of anything mech-related, such as Pacific Rim, Neon Genesis Evangelion and particularly Gundam. 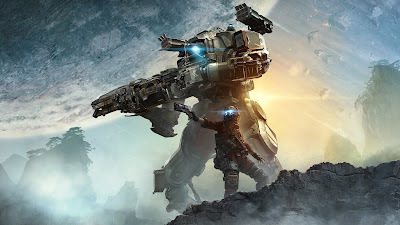 So when Respawn Entertainment and EA released the original Titanfall back in 2014 to critical acclaim, it seemed like an obvious choice for me, with it's innovative pilot mobility options, creative weaponry, massive multiplayer matches and, of course, big hulking mechs (the eponymous Titans) bristling with weaponry. Unfortunately, at the time, I did not have internet connectivity for my Xbox 360, and it would be over a year before I did. By that time, the shine had worn off and the game servers were largely a ghost town due to a lack of online multiplayer modes and no single-player aspects whatsoever, so I was never able to play the original. When a sequel was announced in 2015 and it was added that the game would include more online multiplayer content as well as a single-player campaign mode (plus that teaser image of a sword-wielding Titan), I was immediately sold on the game and determined not to miss out this time. a rifleman in the Militia, who aspires to one day become a Titan pilot. In the universe of Titanfall, Pilots are seen as the ultimate example of military force, tipping the balance of combat even without their mighty mechanical allies. During a failed military operation on an IMC research facility on the planet Typhon, Jack ends up becoming linked up with Vanguard-class Titan BT-7274 after BT's pilot is KIA. The two immediately set out to regroup with Militia forces and complete the mission, along the way encountering the forces of Kuben Blisk and his Apex Predator mercenaries, who are fighting alongside the IMC military. The campaign is extremely solid, both in storyline, gameplay and amount of time it takes. The graphics are beautiful and you frequently come across huge sweeping vistas of the densely-forested and mountainous Typhon while transiting between objectives. You also spend time in a number of varied environments, fighting in forests, war-torn cities, large industrial facilities and even atop warships as they race through the atmosphere. The gameplay is also as varied, alternating between excellent platforming segments involving wall-running and double-jumping, fighting on the ground as Jack and then fighting other Titans while piloting BT. The boss fights against the various Apex Predator members stand out in particular, as you trade blows and try to manage BT's various abilities' cooldowns so that you are never caught without an option. These encounters had a very tactic-based feel, not unlike a good game of chess, that kept me on the edge of the seat and gripping the controller tensely as I tried to get the upper hand. The worst segments (and I hate to use that term) were the moments fighting as Jack. I did not hate them, but they did not stand out as particularly enthralling or unique and I was usually glad when the chance came to get back in BT or go do another wall-running, double-jumping platforming segment. The main characters are well-developed and managed to never be grating over the roughly 8-10 hours that I spent on the campaign. Jack is a good-natured guy who just happens to be simultaneously living his dream while getting in way over his head, and he cracks the occasional joke when the situation calls for it. BT-7274 plays the straight guy in the duo and tends to not get Jack's jokes, causing plenty of comedic moments, while also making a few of his own later in the game, having developed a very dry sense of humor from his time with Jack. Apex Predators' founder and leader, Kuben Blisk, is also a very interesting character, as he has no loyalty towards the IMC and seems to bear no grudge against Jack, simply viewing him as an obstacle in his way to a paycheck. At times he even displays a modicum of respect towards Jack and his skills. Mysterious robot Ash and loyal second-in-command Slone, both members of the Apex Predators, are also some of the most intriguing characters in the game and I was sad to see that they did not get more time. If I had to point out any flaws to the campaign, the aforementioned combat segments with Jack would be one of them. The gameplay itself was not the cause, as all the controls and motions become second nature and the guns all look and sound great, while having a visceral feel as you blast away and score hits with them. It is just that, especially when surrounded with the platforming and Titan combat sequences, they did not feel as unique as the rest of the game. They could have been cut-and-pasted out of any of the more recent Call Of Duty games and you would not notice it. The other minor gripe was that the game assumes you are already familiar with Titanfall lore and immediately starts throwing out acronyms, names and terms such as SRS, IMC, Militia, MRVNs, Simulacrams, the 6-4, the Angel City Elites, Sarah Briggs and General Marder without telling you what these are. This would be excusable if it had been developed in the original game, but without a single-player mode that game developed the lore through brief, and largely forgotten, radio transmissions at the beginning of matches. I still am not sure if the IMC is the legitimate government turned corrupt and the Militia is a resistance organization, or if the Militia is the legitimate government and military and the IMC is a rebel group determined to overthrow them, and the game never seems intent on clarifying. It just establishes a mentality of “Militia is good, IMC is bad” and leaves it at that. Titanfall 2 is largely based around it's multiplayer aspect. And, boy, is there a lot to learn and experiment with. If the original was panned for a lack of content, the amount of different game modes and customization should keep people satisfied this time around. There are 8 different game modes, with some including AI enemies and others including or excluding the use of Titans. The Bounty Hunt mode has been the main focus of my attention. Bounty Hunt is is similar to Halo 5's popular Warzone but maintains it's own flavor. To opposing teams of players face off on a map along with waves of AI enemies. Killing AIs nets your team money and also accumulates a bonus for your character and builds your Titan. At the end of a wave, two “banks” open and you turn in your collected bonus to add to your team score. Killing (non-AI) enemy players will also rob them of half of their bonus. The beauty is that this game mode has less of an emphasis on PvP, although it still matters to a degree, for those of us who are not quite as skilled. The matches also tend to be quite long, giving players a chance for multiple Titanfalls. The customization aspect gives you a lot to experiment with. 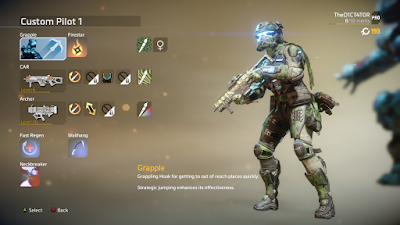 There are 6 different Pilot classes to choose from, including a grappling hook, temporary invisibility and a throwing knife that sends out sonar pulses. There are also 6 different grenade options, including my personal favorite, the Firestar, a throwing star that lights a thermite fire wherever it strikes and deals damage-over-time. And then there are the weapons, and there are a whole lot to choose, from shotguns to assault rifles to grenade launchers and anti-Titan weapons. The game allows you to create up to 10 customized loadouts and you could fill all those slots and not have two identical characters. Grapple - Pilot tactical ability. Allows the Pilot to traverse terrain, build momentum for jumps and even grapple enemy pilots and Titans. Firestar - Pilot Ordinance. Throws a small shuriken that releases flammable "thermite" on contact. CAR - SMG with impressive range and power. Good all around. Archer - Anti-Titan homing missle launcher. 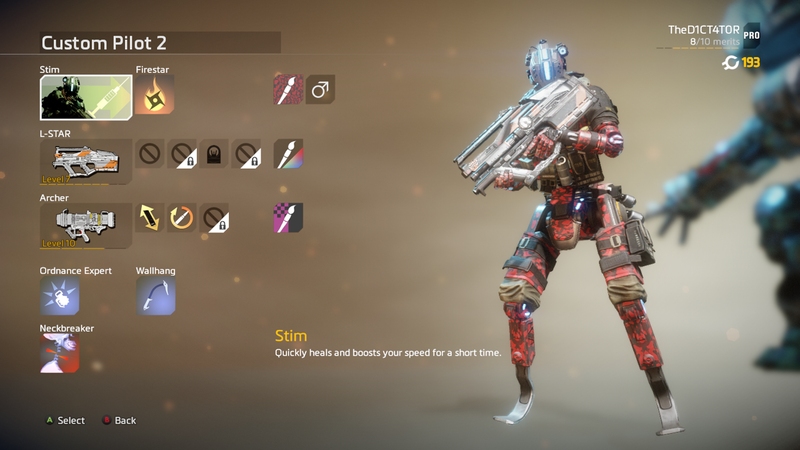 Stim - Pilot tactical ability. Rapidly heals the pilot while greatly enhancing speed. L-Star - Anti-Personal fully automatic particle accelerating light machine gun. Cloak - Pilot tactical ability. Allows the pilot to become invisible for a short amount of time. Gravity Star - Pilot ordinance. Throws a small shuriken that creates a gravity field, pulling enemies in and levitating them. Spitfire - LMG with heavy recoil but evens out the longer it is fired. Thunderbolt - Anti-Titan energy weapon. Fires a large slow moving ball of lightning. And then there are the Titans. In the campaign, BT's mobility and armor remains the same despite whatever loadout you have equipped. In the multiplayer, every Titan is unique, not just in their weapons but in how fast they move, how durable they are and how many dashes they possess. Each possess their weapon, 3 abilities and then their devastating ultimate “Core” abilities that charge as you kill other pilots and enemies and damage and destroy Titans. There are 6 Titans to choose from, and they are the laser-based Ion who is an all-arounder that is comfortable at almost any range and situation, the fast close-range scrapper Ronin who carries that sword from the trailers and a triple-barreled shotgun, slow-but-tough brawler Scorch who deals punishing damage-over-time from his thermite launcher, homing missile-equipped Tone who excels at mid-to-long range combat against other Titans, the quintessential long-range sniper Northstar who can also fly and the tanky Gatling-gun equipped Legion who is solid at any range. Each Titan also allows customization of certain attributes, both specific and non-specific to their model, and there are a dizzying number of camouflage and nose art options for each Titan. The learning curve for the Titans is fairly steep, and it takes a few hours to learn which maps they are stronger at and which Titan counters which, but getting the hang of that gives you a large edge over the competition. Once again, the multiplayer is not entirely without fault. 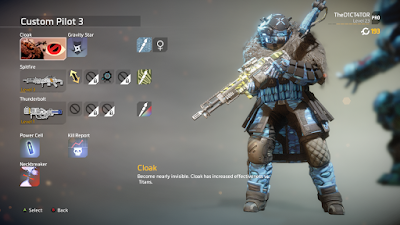 The inclusion of the invisibility-based Cloak class is a major misstep. Stealth-based abilities tend to be a real buzzkill in multiplayer games, and this is no exception. People seem all too eager to put the Cloak together with shotguns and turn multiplayer matches into a camp-fest that is near ragequit-inducing. Honestly, it is hard to blame that on the game, as it is more the fault of people who cannot avoid being degenerates, but Respawn should not have given people the opportunity. Another than issue that I run into is people who do not understand the game mode. This is particularly true in Bounty Hunt where many players seem more intent on racking up an impressive Kill/Death Ratio than collecting bounties. I cannot count the amount of instances where the match ends and the guy with 20+ Pilot kills is dead last with about $50 while I am sitting at the head of the team with less than 10 Pilot kills but over $1500 because I was busy collecting bounties. But once again, more peoples' fault and less Respawn's. Also, I predict that their may need to be a little bit of a Titan rebalance, because it seems like 4 out of 5 Titans on each team is either Ronin or Legion. And also, and I am getting into real nitpicking territory, the menus in multiplayer tend to have long load times before they display and the matchmaking when trying to invite friends can also be very bulky. Overall though, Respawn should be proud of their sequel. In an age of multiplayer-based FPS where the campaign mode is just tacked on, the campaign manages to be engaging, and interesting, and has emotional depth an impact with a number of moments that stand out. The multiplayer has a variety of pilot skills, weapons, Titans and modes, so everyone should be able to find something to engage their interest. The entire game is a beautifully chaotic experience, with missiles, bullets and lasers flying everywhere, Titans raining down everywhere, constant explosions and Pilots parkouring their way across maps. I've been putting in a number of hours with Sage in multiplayer and we have been having a riot, even when we are losing, and I tend to be one to avoid competitive multiplayer. Bottom line, if you are considering buying the game and are worried of a repeat of the original, do not worry, there is a lot more substance to the sequel. And if you were not playing attention to this game before release or were unsure if it is worth getting, I definitely recommend taking it for a spin.